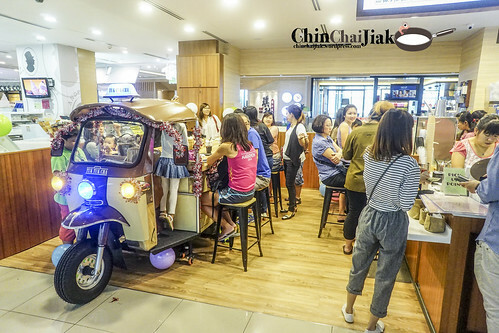 Tuk Tuk Cha, a sister F&B business of Thai Boat Noodle at Bedok Point, specialises in Thai milk tea and toasts and they officially opened their door for business on 4 July 2015. 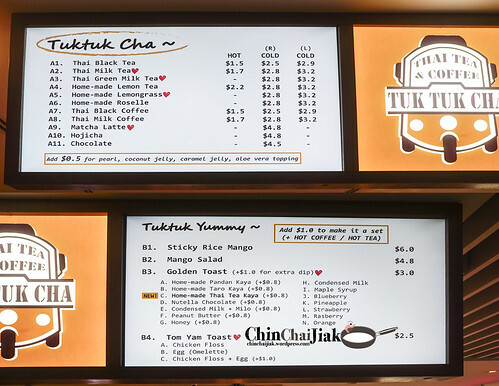 Tuk Tuk Cha is not exactly a sit-down cafe but more of a snack bar situated at Suntec City. 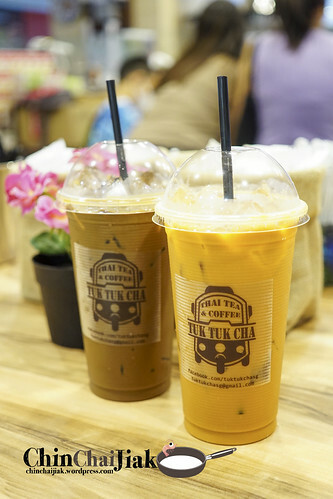 Tuk Tuk Cha mainly offers Thai-style beverages like Thai Milk Tea, Thai Coffee and also Thai Green Milk Tea. 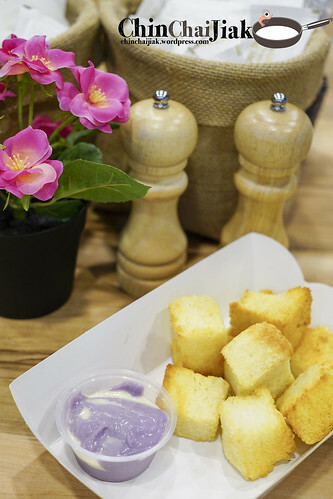 They also offer savoury and sweet toast, together with Mango Sticky Rice, Papaya Salad. 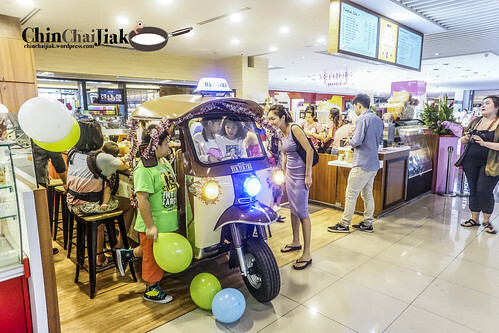 The Tuk Tuk converted dining table is their trademark that can not be missed. Their Pandan Kaya Golden Toast is definitely my favourite. 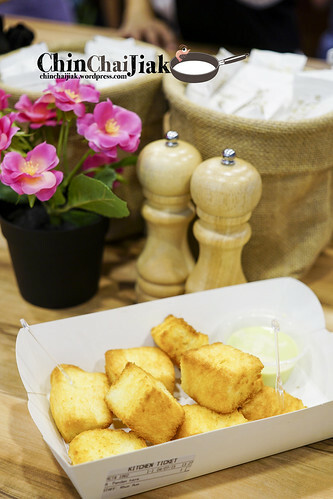 The butter infused bread cube is quite remarkable, with the edges toasted to crisp while retaining a soft spongy center. Among the two flavours, i very much prefer the home-made pandan kaya over the Yam. Unlike the pandan kaya, I felt that the Yam flavour is too mild and at first bite, it’s overpowered by the buttery bread. It’s quite a different story for the pandan. Their pandan kaya is something different from our usual Kaya. It’s more creamy and has a very strong pandan flavour. 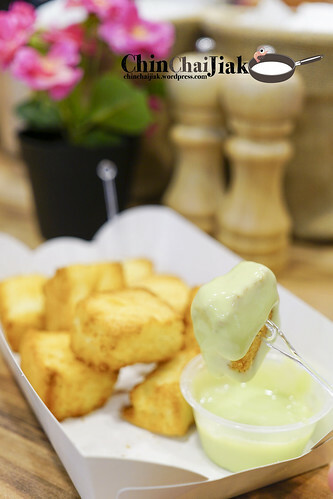 This dip is not overly sweet and goes very well with the toasted bread cube. This dip is wiped completely clean by the time I finished the toast. 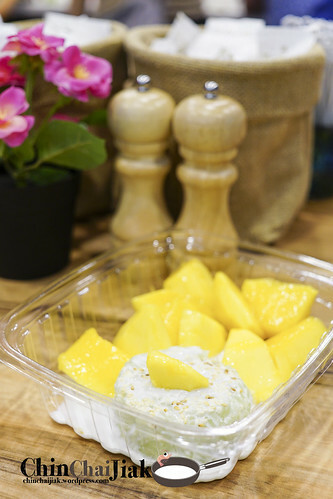 At $6.00, it comes with a very reasonable serving of Mango. I have no complain for the Mango – thickly cut, juicy and sweet. I also like the pandan fragrance and a little savoury flavour from the glutinous rice. There’s quite some standard for such a food stand and the only complain is, the rice falls apart a little too easily. This tom yum toast taste much better than it looks. It’s abit lacking in term of presentation but definitely not in taste. The sweet chicken floss is infused with a drench of spicy Tom Yum sauce, giving the toast of a mix of sour, spicy and sweet flavours. Note that the spicy level is higher than average, and that is what made it enjoyable. I prefer their Ice Coffee more than their tea. 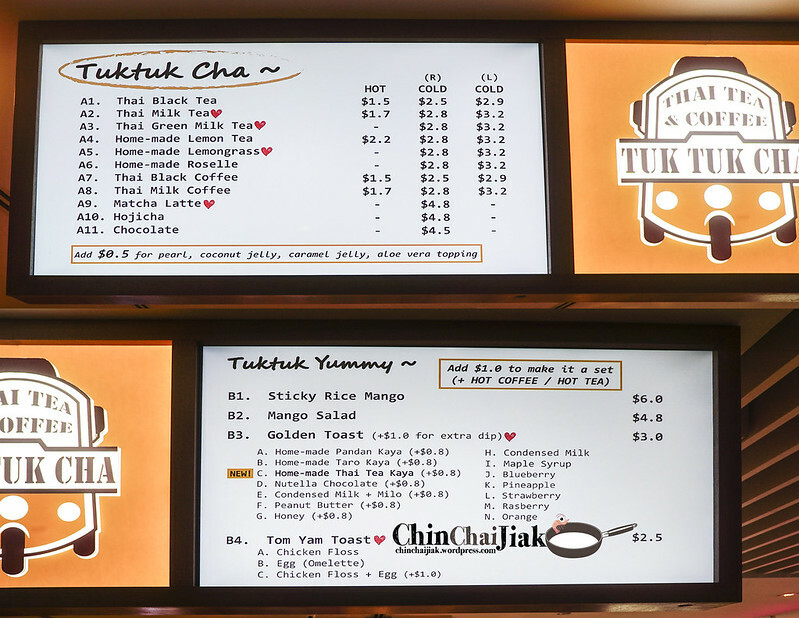 I like to highlight that like a true blue Thai Milk Tea / Coffee, Tuk Tuk Cha’s version is much sweeter than our Singapore version . I ordered a less sweet version during my subsequent visit. I really like the strong coffee fragrance and the sugar level made this an instant energy booster. As for the tea, i feel it’s a little lacking in term of the richness in the milk taste. I find that their concept is quite good, instead of doing as cafe style, they do in like a Ya Kun style and enables them to keep the price low. Among all, I like their golden toast the best. 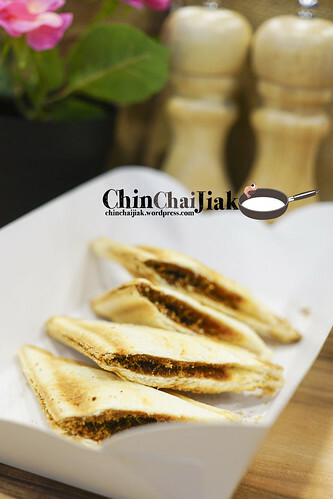 In Singapore, many similar bread toast is either too crispy or not cripsy enough but Tuk Tuk Cha’s is just to my liking. Price wise, it’s very reasonable. $3.20 for a large ice milk coffee and $3.80 for their butter toast and despite the low price, the quality isn’t lacking either. This new addition in the mall gives me one more reason to be excited with the newly renovated Suntec City.